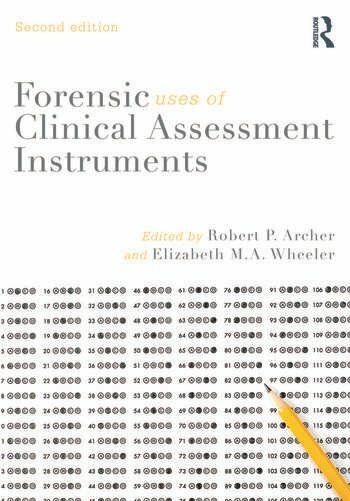 Archer, Stredny, Wheeler, Introduction to Forensic Uses of Clinical Assessment Instruments. Sellbom, Anderson, The Minnesota Multiphasic Personality Inventory-2. Ben-Porath, The Minnesota Multiphasic Personality Inventory-2-Restructured Form. Archer, Handel, The Minnesota Multiphasic Inventory-Adolescent. Morey, Meyer, The Personality Assessment Inventory. Craig, The Millon Clinical Multiaxial Inventory-III: Uses in Forensic Settings. Weiner, The Rorschach Inkblot Method. Hare, Black, Walsh, The Psychopathy Checklist-Revised: Forensic Applications and Limitations. Book, Forth, Clark, The Hare Psychopathy Checklist-Youth Version. Zillmer, King, Forensic Neuropsychological Assessment. Achenbach, Rescorla, The Achenbach System of Empirically Based Assessment (ASEBA): Applications in Forensic Contexts. Abidin, Flens, Austin, The Forensic Uses and Limitations of the Parenting Stress Index.